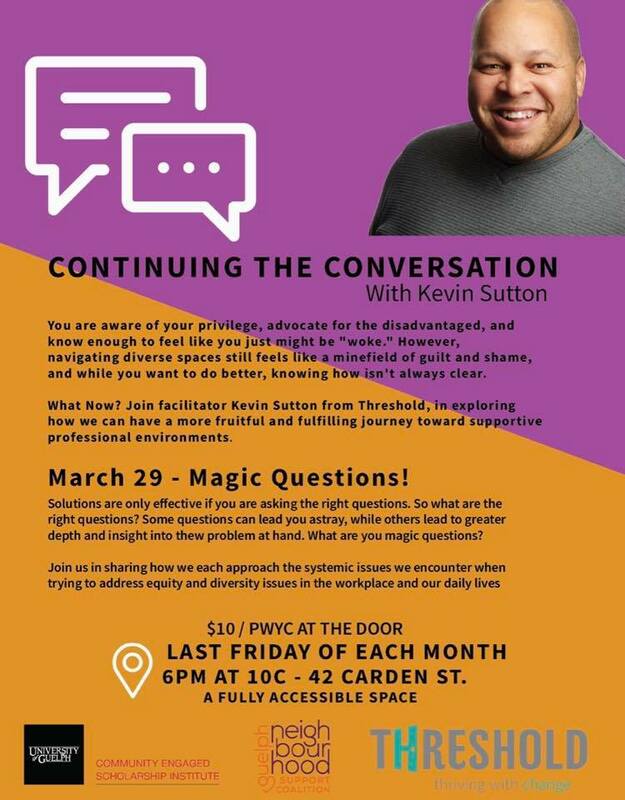 Thanks to everyone who took part in the “Continuing the Conversation” series with Kevin Sutton in February. We are so excited to announce that because of the overwhelming response to Kevin’s series, the conversation continues! Each month a new conversation will be happening. This month’s is March 29 and is titled Magic Questions! All are welcome. You are aware of your privilege, advocate for the disadvantaged, and know enough to feel like you just might be “woke”. However, navigating diverse spaces still feels like a minefield of guilt and shame, and while you want to do better, knowing how isn’t always clear. What Now? Join facilitator Kevin Sutton from Threshold in exploring how we can have a more fruitful and fulfilling journey towards supportive professional environments. Solutions are only effective if you are asking the right questions. So what are the right questions? Some questions can lead you astray while others lead to greater depth and insight into the problem at hand. What are your magic questions? Join us in sharing how we each approach the systemic issues we encounter when trying to address equality and diversity issues in the workplace and our daily lives.